Win the Sakamoto National Maths Competition & get a chance to meet Japan's astronaut Mr Taichi Yamazaki! 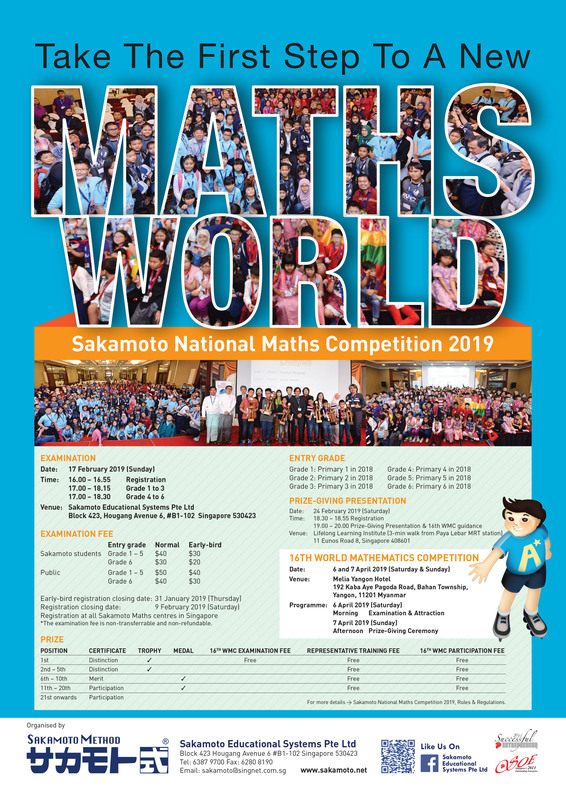 Join the Sakamoto National Maths Competition and sharpen your mathematical skill! Top 20 students in each Grade are entitled to participate in the 16th World Mathematics Competition to be held in Yangon, Myanmar, on 6 & 7 April 2019. What's more, they will also get a once in life time opportunity to attend a Space Talk by Japan's astronaut, Mr Taichi Yamazaki! $10 early-bird discount is given to the registration by 31 January 2019. Registration at all Sakamoto Maths Centres in Singapore now!